We headed down to Northfield last weekend to see the family. Here are some random pictures from Jamie's Dad's house. So what has Sylvia been up to lately you ask??? 2. Learning to play with her finger foods. She hasn't mastered the task of putting them in her mouth yet, but can throw them on the ground quite well. Lucy sure doesn't seem to mind. 3. Her balance has improved greatly and will sit for along time without support. She will go from sitting to her belly, but hasn't quite figured out the reverse. 5. Fighting off her first tooth. 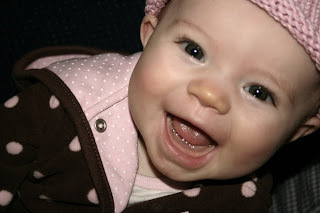 Starting last Thursday, she just wasn't the same baby, and we now believe it was due to her teething. 6. And finally, she is leaning into whoever is holding her for the 'snuggle' and if you are lucky, you will even get a hug! I have never really enjoyed Valentine's Day. Flowers are expensive and they die quickly, it is hard to get reservations at the good restaurants, and you have to spend $4 on a card that is thrown away the next day. This year was different. We decided about a week ago that we would stay in and cook our own meals for Valentine's day. First Jamie prepared some great huevos rancheros for breakfast. Jamie's mom brought over all the ingredients to night before when she watched Sylvia - Thanks Charleen! In addition, I had come across a recipe for BBQ Brisket Pizza that looked so good, we just had to try it. I was loving it because a) we don't have to go out for Valentines dinner and b) we get to eat Pizza for Valentines! I gave Jamie the night off, so she enjoyed reading that damn book, Eclipse by Stephenie Meyer. For those not familiar with the series of books, where have you been? Basically, when Jamie gets a new book, she goes into 'crazy psycho reader mode'. So while I was slaving away over the hot stove, she enjoyed a glass of yummy wine. We first tried this wine at Napa Valley Grille when Jacob worked there. It was an Orogeny Pinot Noir, and it is awesome. Back to the meal... It was pretty simple to make. Homemade crust covered with BBQ sauce, then the beef brisket, followed by two large onions that had been caramelized. Topped off with some fresh mozzarella cheese. Pop it in the oven for about 15 minutes and we were ready to go. For those that are wondering, the best Valentine's Day meal ever was our first year together when I reheated some Lasagna I had cooked the day prior. After that dinner, we topped the night off by watching TV. How romantic! Here is a sample of one the outfits she wore last week. It was a dress that Grandma Brodd gave Sylvia for Valentine's Day. Also notice the "Olive You" hat that Grandma Charleen knit. Not to exclude anyone, she is playing with a handmade purple dog from Megan via Etsy, while sitting on a blanket the Trinity knit. Happy Valentine's Day from Sylvia!!! I think she enjoyed her special V-Day meal of parsnips and rice. She liked them so much, she was in a 'giggly' mood. She had a great day overall. Yoga in the morning, shopping in the afternoon. Smiling and laughing throughout the day. If we are lucky enough, maybe even some pictures later tonight showing off all of her Valentine's day outfits. Yes, outfits! She wore V-day themed outfits everyday this week to daycare. As I am sure some of you are aware, the 1st Saturday in February is known as 'International Eat Ice Cream For Breakfast Day'. We have celebrated this event for many years, usually at the Sebastian Joe's in Uptown. This year was a little different since Charleen and the boys spent the night at our place on Friday, we opted for a quieter setting at home. Jamie and Charleen made about 20 waffles and we enjoyed a nice bowl of ice cream on the side. The night prior also had some fun and exciting things... Jamie and I enjoyed a night out (at the curling club) when Charleen watched Sylvia. Scott and Liz's son Zach was also over. To finish off the kids, Jared and Blake joined the mix... With all the kids over, Jamie and I decided to build a fort for them to play in. Here is a picture of our creation. The kids played, ate tons of popcorn, and watched movies. Jared and Blake even found some really good hiding spots upstairs in our closet... While in the meantime, the moms and dads enjoyed some curling, some tasty beverages, and a few laughs. 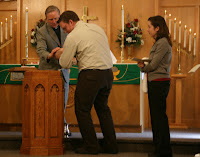 Last Sunday, February 1st, Sylvia was baptized at Faith Lutheran Church in Hutchinson. Pastor Randy Freund conducted the ceremony. After the service, which Sylvia did great through by the way, we headed over to Mom and Dad's house for lunch and some socializing. Blake enjoyed one of the ribbons, I mean cravat. 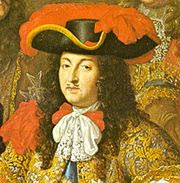 Maybe a young Louis XIV? I think we all had a great day and it was good to get both families together again. I think the last time this whole group was together was at our wedding, five and a half years ago! Our young model Blake wasn't even born yet! Look at me - I like to sit now!